Jakarta is the capital of Indonesia with about 9,6 million citizens. A lot of people say Jakarta is too crowded, dirty (because of the smog), hot and therefore not necessarily worth a visit. But I like to think otherwise. Yes, it’s crowded and chaotic, but once you get used to that you will see this city has some great things to offer. Especially when you are interested in some (Dutch) history, Jakarta is an interesting metropolis. You can still see the Dutch influence for example in the buildings on Taman Fatahilla square. In the Jakarta History Museum you can get a glance of live in the earlier Dutch East Indies. When you are interested in some (Dutch) history, Jakarta is an interesting metropolis. 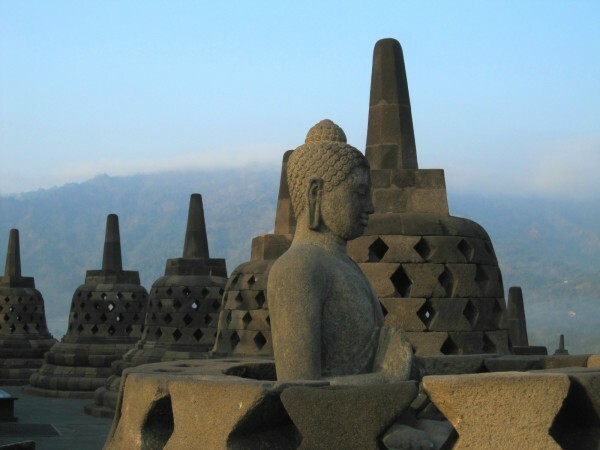 Borobudur is one of the most famous sights of Indonesia. Yes, it’s full of tourists, but since it’s the largest Buddhist temple in the world and a UNESCO World Heritage Site, you cannot skip a visit. The temple is designed as a mandala and has nine platforms in total, six square and three circular, topped by a central dome. The temple represents the Buddhist cosmos. Next to a lot of tourists, the temple is also visited by many pilgrims. A pilgrim must walk every platform 7 times, clockwise and from bottom to top. This way, he or she will reach Nirvana; an ultimate state of soteriological release and liberation from rebirths. Prambanan is probably just as famous as Borobudur, but this sight belongs to a completely different religion. 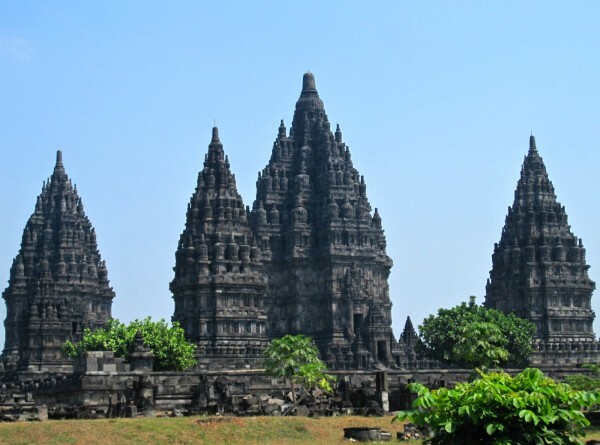 It’s the largest Hindu temple of Indonesia and a UNESCO World Heritage Site. The compound consists of more than 200 temples, but the three main ones are the Trimurti temples; the largest one (47 metres) is dedicated to Shiva, God of Destruction. The two temples next to this one are dedicated to Brahma, God of Creation and Vishnu, God of Preservation. Like Borobudur, visitors should officially enter each temple from the east side and circumambulate clockwise. While a lot of people visit Mount Bromo, the most famous volcano of Java, I decided to visit another volcano during our holiday in Indonesia; Ijen. 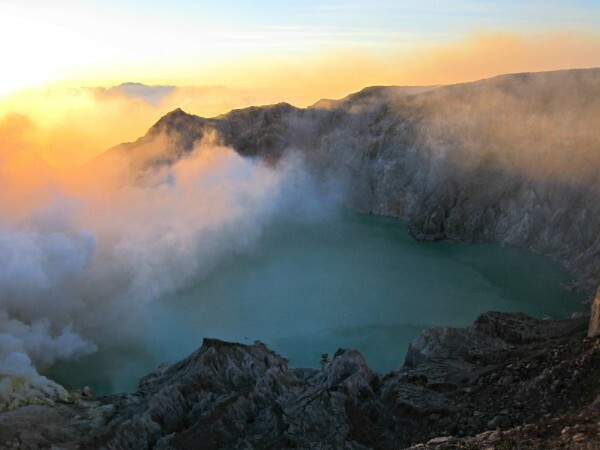 Ijen is one of the few volcano’s with a crater lake. This lake contains a huge amount of sulfur, which supports a mining operation. Miners walk down the crater about twice a day to load the sulfur in baskets and carry it up to the crater rim and down the mountain by hand. This is a very labour-intensive operation, not to mention a very smelly one. When visiting the Ijen volcano, you should wear old, very old clothes. Even after washing them for about 10 times, I could still smell the sulfur! But you will see this is all worth it when you climbed Ijen and are standing at the crater rim and see the sunrise or sunset. The view is just indescribably amazing. And if you have the guts, you can even walk down the crater when it’s dark and see the so-called blue fire, which actually is ignited sulfuric gas. 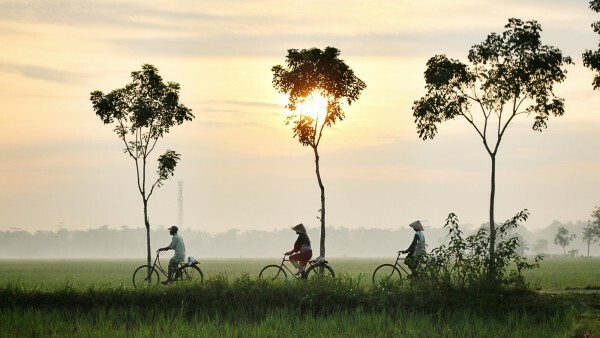 In my next blog, I will continue my trip through Indonesia and give some insights in the interesting culture of Bali.